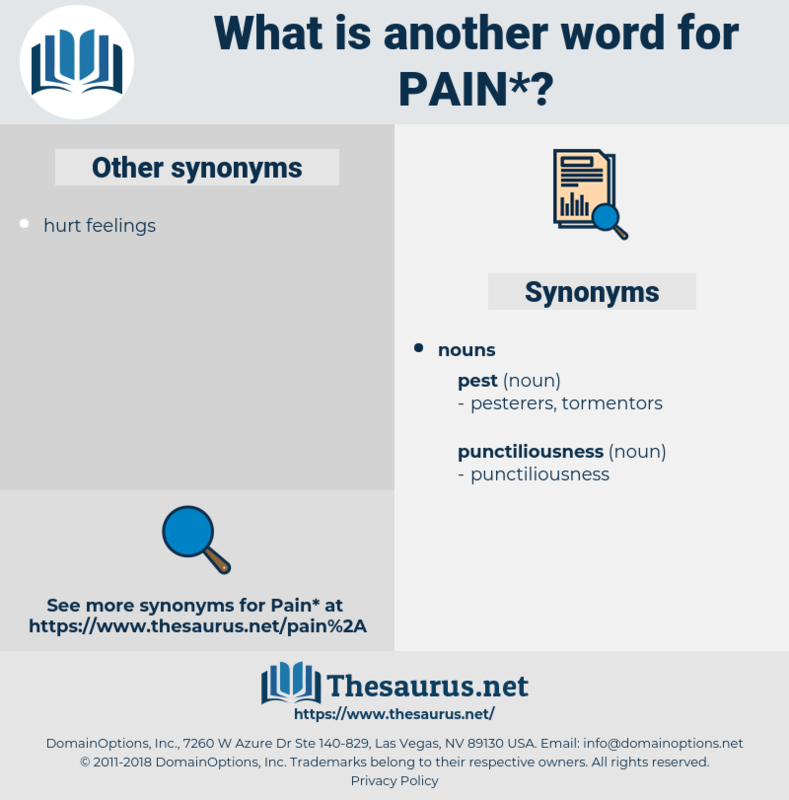 What is another word for pain? Punishment suffered or denounced; suffering or evil inflicted as a punishment for crime, or connected with the commission of a crime; penalty. 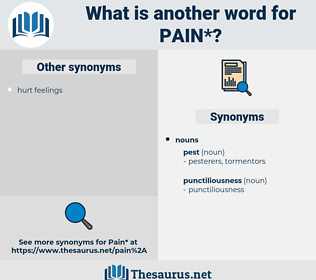 anguish, soreness, distress, ache, hurts, torment, torments. prints, analgesia, plight, trouble, sting, sentence, heartbreak, damage, misfortune, sacrifice. painkiller, discomfort, misery, affliction, headache, sadness, inconvenience, heartache, penalty, punishment, bitterness, trauma, difficulty, anxiety, nausea, embarrassment, bereavement, unhappiness. assistance, comfort, health, advantage, cheer, relief, contentment, benefit, aid, pleasure, help, blessing, joy, good health, ease, wellness, happiness. inattentiveness, inertia, comforter, inactivity, rapture, heedlessness, smoothy, smoothness, dormancy, laziness, fluency, assuagement, well-being, inattention, quiescence, charmer, languor, inaction, Soother, enjoyment, consolation, security, peace, inadvertency, adroitness, alleviation, solace, indolence, facility, negligence, idleness, pleasance, easiness, inadvertence. assist, encourage, mend, alleviate, cure, relieve, fix, assuage, appease, praise, placate, calm, please, let go, heal, soothe, make happy. Because of the note of pain, Coats drew his chair close to hers, touched her arm. Why has he sent me no word in all these months of pain?